So busy these next two days that I won't have time to edit my quilt photos for a bit. Which means just a sneak peek of the top. I'm such a quilt tease. 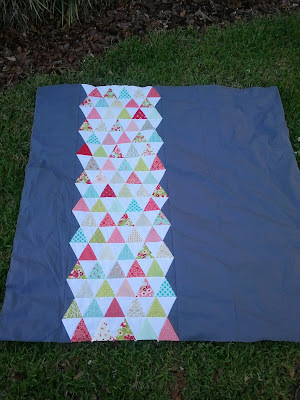 *Linked over at Quilt Story and SewHappyGeek! I love the balance of triangles and negative space! I love the dark contrast, it makes your triangles that much brighter! That is going to be really pretty. Can't wait to see the finished product. Heh, such a tease. I love it already!